Grow crystals on a starfish or a shell for a pretty beach-themed decoration. 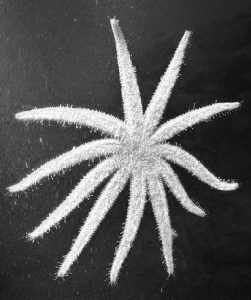 Grow crystals on a starfish to make a sparkling crystal starfish ornament or decoration. You can grow any crystal solution on the starfish, including borax, salt, alum, Epsom salt and sugar. Borax is nice because the crystals grow overnight and add a dainty sparkly appearance to the starfish. Also, these crystals survive storage and packing between holidays quite well. Tie a string or piece of nylon fishing line to the starfish. Make certain the starfish can hang in the jar without touching the side or bottom. You can wrap the string around a pencil or butter knife to control its length. Remove the starfish from the container. Mix a solution of very hot or boiling water and borax. Keep stirring in borax until it stops dissolving. This will be when a small amount of solid material remains in the bottom of the container. Pour this solution into the jar. Suspend the starfish in the liquid. Make certain it is submerged, but not touching the jar. Allow the crystals to grow for several hours or overnight. Remove the crystallized starfish from the liquid and hang it to allow it to dry. That’s it! You can use it as a holiday ornament or other decoration. You can store the starfish by wrapping it gently in tissue paper to protect it from dust and humidity. Borax allows the natural color of the starfish to show. However, if you want to add color, you can. Simply add a small amount of food coloring when you mix the borax and water. The food coloring does not color the crystals, but it will dye the starfish. Try growing crystals on small shells. You’ll have the best success with porous shells because they provide places for the crystals to attach and grow.